Genius Games has announced a Kickstarter campaign for its upcoming party game Nerd Words: Science which will run until April 11, with an anticipated October release month. The game will allow players to find out secret scientific words based on clues given to them. Nerd Words: Science! is a word game where teams pit their wits (and some science knowledge) against each other with the goal of figuring out Secret Science Terms based on Clues given to them. In each round the lead scientist chooses a Term from a hidden pool of science words. They then reveal a series of Clues associated with the Science Terms. The first three Clues must begin with a different letter in the Science Term other than the first letter, slowly spelling out the Science Term as well as hinting at the content of the Term. If neither team has figured out the Science Term, the fourth and final Clue will begin with the first letter of the Term as a last ditch effort! After each Clue, both teams have 60 seconds to submit a Guess and place a bet based upon how confident they are in their Guess. Each team to correctly guess the Science Term scores points based on their bet and the team with the most points at the end of the game wins! “The Nerd Words: Science! crowdfunding campaign will have built-in stretch goals that will add to the complexity and fun of the final game that include component upgrades and special ‘topic’ packs of new Science Terms, including earth science, astronomy, and medicine that players can add into the game,” added Genius Games’ Coveyou. 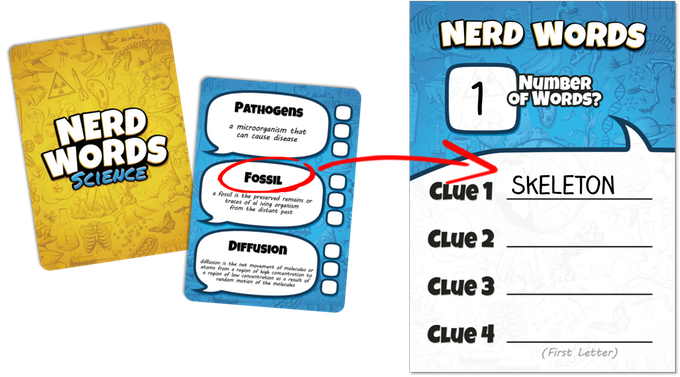 For those that want to save their money on a copy of the game, the Kickstarter campaign offers a copy of Nerd Words: Science for $19, which is a a great deal compared to the $29.99 MSRP.